Debe realizar reservaciones con al menos 5 minutos de adelanto en Restaurante Lorenzillos Los Cabos. Lorenzillo`s abre sus puertas y le invita a recorrer sus espacios por dentro. Lorenzillo`s esta edificado en la esquina de la marina. Hermosos detalles estàn presente en todo el restaurante. Callo de hacha a la plancha sobre totopos de maíz y guacamole ¡Muy recomendable! Service was absolutely amazing. Maitre D got us a cab as soon as we left. Wait staff was all over our table, very impressed with the service. Make sure you try the lobster croquettes and lobster tail made to you liking! Es nuestro lugar favorito para cenar. Pedimos langosta, Busquet de langosta, camarones al ajo y todo delicioso. Lo que no nos gusto fueron los callos montados sobre tostadas de aguacate, tenían poco sabor. El postre volcán de chocolate es una delicia. Tourist trap. No food is fresh. Totally overpriced and poor food. El Pizole de langosta es una delicia y en general todos los platillos que pedimos con muy buen sazón. A bit of a "tourist" spot where waiters try hard to upsell everything from wine to the food. experience was OK but not great; for the prices it should have been great. I much prefer Sunset M over Lorenzillos. Trajeron lamgosta que sabía a que habia estado congelada, la consistencia muy dura y desabrida. Muy caro para presentarse con algo congelado. Una garantía para degustar mariscos frescos con una preparación esmerada y una gran atención por parte de su personal. Carta de vinos amplia y variada y un lugar que ofrece una experiencia única por su decoración y sus vistas lo hacen una visita obligada en Los Cabos. Excellent food ambience and Carlos was fantastic. Service was excellent. Food was amazing. What a great place. Cocktail selection like no other place. Appetizers to die for. Definitely get the lobster, their specialty. Today is Valentine’s Day. Myself, my wife, and four close friends are staying at a local resort. The resort has had much better service than Lorenzillos’s the entire time we have been in Cabo. Our meal took two ours to come to the table. I took the server’s advise on the cut of meat and should have ordered the filet I had originally asked for. My wife ordered a Caesar salad that our server completely forgot about. We enjoy eating at fine dining restaurants regularly, and this was the most expensive meal in combination with the worst service I have ever had. I cannot remember a worse dining experience. I will tell anyone who is traveling to Cabo to stay away from Lorenzillo’s. A great evening at our favorite restaurant in the marina area of Cabo. They fix lobster more ways than anywhere else we have gone. The staff is very attentive, friendly and professional but not overbearing. My husband loves a Manhattan cocktail and he says they fix one of the best. We love this place! Great lobster, fantastic shrimp cocktail and yellow tail carpaccio beautiful roof top setting and very attentive wait staff. Wine selection is wonderful as well. Prices are on the high side so it may not be an every day place but if I had one near me I’d be there regularly! I celebrated my birthday with a group of 15 people, both the food and the service was amazing! I plan to visit Lorenzillo's anytime I visit Cabo or any of their other locations. The food was not to my liking at all. I had the seafood crepe. The lobster and shrimp inside were way over cooked and chewy. The crepe itself was swimming in sauce that was tasteless. Just made everything soggy. The crab cakes were nice and crispy with a good sauce but very little crab. This restaurant needs to catch up with the other, higher quality, restaurants in Cabo. Our waiter, Carlos was so attentive and efficient. He also had a good sense of humor and was a pleasure to have as our waiter. We cannot say enough good about him. He gets 5 stars along with 5 stars for the restaurant. We will continue to bring our guests here. We love this restaurant. Thank you. Excelente servicio y comida. Me encanta el lugar y con un gran ambiente. 4 pm reservacion made in advance (3 weeks) the restaurant was empty and we were assigned to the worst avaible table (no sea view). After our complains, the host, with a very bad acctitude, gave us one table in the middle of the terrace. He said that everthing was reserved in advance. We left at 7 pm and the best tables were still empty. The service of the regular waiters was very good and the food very expensive but excellent. They just lost a customer because of the Host. Great place. Wonderful food - we had lobster instead of turkey for Thanksgiving. Our server was Marino and he was outstanding. We really enjoyed Lorenzillo's! La langosta es deliciosa y el servicio de Pepe fue extraordinario. Just Loved Lorenzillos, great service, fabulous food and reasonable prices. Had the Pacific Seabass which was delicious and the portions were enormous. Definitely a must visit restaurant. Best lobster around! Have it a la plancha! Dorian was my waiter and he took excellent care of me. He made sure my Cesar salad was tossed perfectly, even down to how many anchovies I wanted. 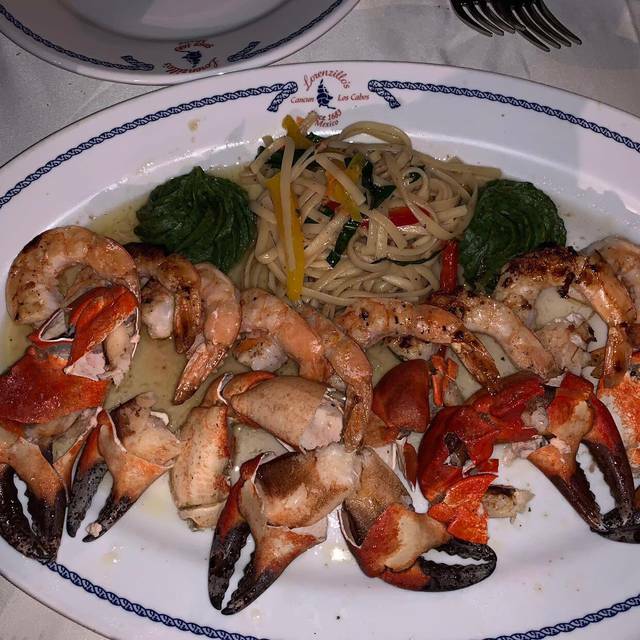 Delicious fresh seafood, beautiful sunset views of the marina, attentive service! We went to Lorenzillos to celebrate our daughter's 40th birthday on September 14th. She wanted lobster and we wanted a special dining experience but ultimately our dining experience was less than favorable. We first sat outside but the flies got so bad we had to go inside - no one's fault but was a disappointment. We started with the lobster bisque which was fishy and watery. It lacked depth of flavor or any recognizable pieces of lobster. 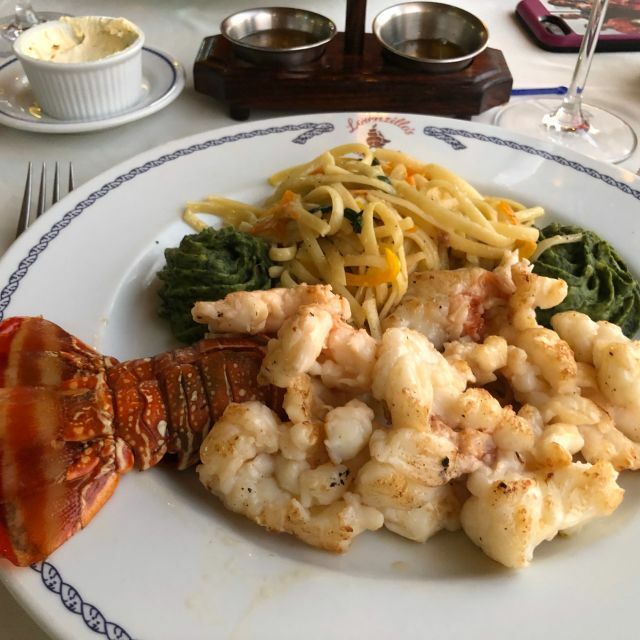 My daughter ordered a lobster tail with garlic butter but it wasn't sweet nor tender. I ordered the sea bass which I expected to be a loin but it was a filet which would of been fine; however, it wasn't trimmed well and also had a less than desirable taste. I should of returned it because it smelled fishy when it was delivered to our table but I didn't - my fault. My husband had the Cajun red snapper which was uneventful. After $365.00 later including drinks, wine and dessert we left unsatisfied and incredibly disappointed. We come to Cabo every year in January and we have dined at Lorenzillos before and had good food but we were extremely disappointed in the quality of food this time. However, I must add the service was impeccable and they did do a very nice celebratory dessert presentation. Needless to say the meal we had looked forward to at the onset of our arrival to Cabo left us sadly dissatisfied and an evening we can't recreate. Best lobster with so many choices of preparation! The food was excellent! This was my second time dining here and I was slightly disappointed. Besides being up-sold during the ordering process, the food just was not that good. We sent back a few dishes that were inedible. Their location is great, just next to the marina, but I won't be back. Made last minute reservations and wanted to get some lobster for my wife. The service was fantastic. I had El Temporal, which is like a Mexican cioppino. My wife got the lobster tacos. Both dishes were great. We shared a clam chowder which was served in a French bread bowl. Interesting it wasn't in a sour dough bread bowl. But was still very good. Deliciosa comida, el lugar es muy bonito y la atención de los meseros increible.